27.10.11 | Permalink | Comments Off on Who you gonna call? Derek Landy’s next Skulduggery Pleasant book Death Bringer! My favorite part (okay, there are a few, but this is the one that I’m thinking of right now that I can write down without giving too much away) is when Skulduggery calls Caelan (that vampire that’s following Valkyrie around if you’ve forgotten the name) a “self-pitying Paranormal Romance reject” Oh yeah, guess what book that’s referring to! For anyone who hasn’t read Skulduggery Pleasant yet please start here ASAP. There is also a semi-short story coming that takes place a couple of months after Death Bringer called “The End Of The World” which will be available next year. About 90 pages long, so longer than the other Skulduggery short stories. So much good. 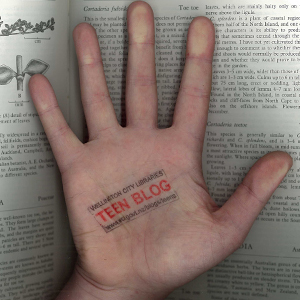 Derek Landy’s blog is here. 13.10.11 | Permalink | Comments Off on Great Read! Bob is lazy, moody and self centered. He’s a teenager with a pet Eck (a sort of bird like creature), a job he doesn’t want and a mother with a gambling problem. He’s also, thanks to one of his mother’s wagers, God. And he’s not very good at it. He made the world in six days, then got bored and tired and decided it would have to do. He’s tied his emotions to the weather and unfortunately for everyone, he’s now fallen in love. Which is causing all sorts of crazy things to happen. Mr B, Bob’s assistant does most of the work keeping the earth (mostly) running smoothly. But now even he’s had enough and applied for a transfer, leaving his favorite thing in the world – the whales – in Bob’s care. Bob’s mother has made things worse by gambling away his pet Eck, the girl he likes is human, and therefore keeps being complicated, and Bob would really rather be chasing her than looking after the world. Fast paced read, still leaves a few questions at the end, but overall very funny and different. It’s a bit of a strange (but good) book, if you liked Good Omens from Terry Prachett and Neil Gaiman or Terry Prachett’s Johnny Maxwell trilogy then you should have a look at this book. The Game, an alternative education system where students learn in a converted mall, playing fun park style games to learn maths, following challenges to gain points and go up levels. Where the sponsors are always watching them, doing market research on what and who is cool or different. Katey/Kid (@kidzero) is fairly happy as she is, she has a few close friends who she records music with and she does quite well in the challenges. She isn’t as connected with the Game as a lot of other players, but it doesn’t really bother her. Until a group calling themselves the “Unidentified” start trying to make a point against the Game. Kid starts to look into their demonstrations and finds herself coming to the attention of the sponsors – and learning that who she is and what she does is something that can be used by other people. Individuality vs being in the crowd, control vs freedom. I liked this book, it’s actually not far off what happens today and how we share information, and I didn’t guess the ending before it got there. Recommended if you like Scott Westerfeld (particularly So Yesterday) or Candor by Pam Bachorz. In Beatrice’s world people are divided up into five factions. People decide if they are brave, selfless, intelligent, honest or peaceful and then dedicate their lives to these ideals. Beatrice grew up in the abnegation faction dedicating her life to helping others. On her birthday, she has the choice – to stay with her family in the abnegation faction, or choose to spend the rest of her life in a different one. At school they have a test that will indicate where they are best suited – everyone should fit easily into one, but Beatrice doesn’t. Something that seems like a small thing, but is regarded as dangerous. It’s called being divergent, and means that whichever faction she chooses, she needs to hide the fact that she doesn’t fit perfectly into the society, while she discovers that the society itself may also not be as perfect as it’s meant to be. Wonderful book, I loved the details in everything about the world and I really want the next book to come out soon! Alternative world, lots of action – if you liked the Hunger Games trilogy by Suzanne Collins then you’ll probably like this as well. The Schwa Was Here and Antsy Does Time both by Neal Shusterman. Antsy feels like he is invisible. He isn’t as good at school as his brother and sister and spends his time at home making peace between his mother and father. He doesn’t think he has ever done anything noteworthy except by accident and a lot of the time he feels unimportant and unnoticed. Calvin Schwa actually is nearly invisible. He can sit in a room and no one will see him or remember that he was there. Half his class think he isn’t real, just an urban legend. But Antsy gets to know him, and by helping the Schwa he manages to stand up for himself, get in a lot of trouble and have a go at making both of them more noticed. A book all about being seen, how people can be very different from what you hear and making decisions about your own life. This book is nothing like Neal Shusterman’s Unwind (although that’s also an awesome book in different ways!). Recommended if you liked The 10pm Question by Kate De Goldi. In Antsy Does Time, Antsy finds out completely by chance that a friend is dying. He only has 6 months left. To try and make him feel better Antsy officially gives him 1 month of his own life, signed and witnessed. And then suddenly everything gets out of hand. He’s a hero, he has a secret, and somehow he has to make things right again with his family, the crazy old man who’s threatening to fire his Dad, his girlfriend, his ex-girlfriend and most of the town. Plus he’s managed to kill off all the plants in most of one street. A crazy, funny story that’s pretty much all about death and dying. Read after reading The Schwa Was Here – it’s a different story, but you do need to know who the characters are and how they got where they are. 06.08.11 | Permalink | Comments Off on I’m reading a book! A perfect town, with perfect people. Teenagers who love doing their homework, who never, ever do anything their parents don’t want and always get to class on time. And then they get perfect marks. Except the most perfect person knows why everything is like this. And he has the power to change it. If you liked the Chaos Walking trilogy by Patrick Ness or Juno of Taris by Fleur Beale then you should put this on your reading list. Good read, great ending. The story (or one version of it anyway) of how the personal computer, Microsoft, silicon valley etc all got started, nearly didn’t get anywhere and how most of it wasn’t really all that planned. At all. If you like reading non-fiction or enjoyed The Social Network, then this will be a fun read. Meg Finn is killed in the middle of helping steal from an old man. But there’s a problem. She’s done some bad things. But then she’s also done some good things as well. So with her perfectly balanced between them Heaven and Hell are both trying to push her over the line to their side. She has one last chance to redeem herself by helping the old man she tried to rob with his wish list. Four wishes, limited time and both Heaven and Hell are breaking the rules. I’d recommend this to younger teens – maybe 13 or so. You’ll probably still enjoy it if you’re older though – I did! To begin with, here is an actual government website from the US on how to prepare for a zombie apocalypse. Get a Kit, Make a Plan, Be Prepared! Zombie survival guide: complete protection from the living dead/ Max Brooks. This wonderful book from the non fiction section covers everything you need to get prepared when the undead attack. Need to defend a building? Head out into the bush? Which weapon works best against the undead? Seriously it’s all covered. And one of the important things I learnt from this book – NEVER set fire to a zombie. They take a long time to burn and keep walking. Major fire hazard. Sure, surviving is definitely going to be a priority at least initially. But after a while it’s just not going to be enough. This book will help you work out a plan to not just make it through the zombie attacks – but take over the world at the same time. Also covers disasters involving ninjas, pirates and parents. As well as being a great read, this book is excellent for researching possible scenarios for outbreaks, and everyday life once zombies are a widespread problem. What if you are babysitting kids that seem to have bad balance and are kept in a locked room? What if you are a zombie and fall in love with a human who has a father who hunts zombies? What if the zombies are also pirates? Also good for unicorns – particularly the wanting to kill people kind of unicorn for some reason. Because you can. Yummy, yummy zombies.